Columbia University’s student paper now has a video out on their strike yesterday. UC Santa Barbara’s kids have worked up a list of the dozens of articles, videos and other press they’ve created and received so far. It’s up on the site here. Sonoma State, SF State, Lowell, Mills, Berkeley and other West Coast schools are featured in an article in today’s SF Chronicle. For some reason, though, the full text didn’t show up in the print edition – only a picture with a caption. There’s also very little discussion of UCSB. What gives? Sonoma’s 300-strong rally was featured in their local paper. UC Santa Cruz’s march and rally (~300) made the local paper as well, although they appeared unable to grasp the fact that the action was multi-issued – being about workers’ wages and opposing the war. The weekly paper seems to have got it. The local Univision had a report as well. Students put up photos here. Emerson College and Suffolk University held a joint action in Boston. They put up photos and more here. On Thursday Feb.15th Mills College had group of about 40-70 people (depending on the time) come out for our anti-war/pro-peace solidarity rally. There were speakers from speakers from A.N.S.W.E.R coalition, World Can’t Wait, code pink, and the freedom and justice party as well as Ehren Watada’s group. Additionally we had local artists and musicians as well as student and faculty speakers and performers who read speeches, poetry, quotes, a selection from MLK’s riverside speech and sang original songs written for the occasion. The Mills College Peace Coalition covered the campus with flyers and banners. The center piece was a five foot long scroll listing names written in arabic of Iraqi civilians killed that was suspended between two pillars in a central location. The rally was a success and is the first step in a series of actions on campus leading up to the anniversary of the start of the war in March. The actions were also featured on Democracy Now! radio. We had a group of five students from St. Louis University in St. Louis, MO participate in an action in conjunction with the Occupation Project on Friday, all five of us were arrested along with two other people after sitting in Congressman Carnahan’s office and having a litany. We decided not to leave until the Congressman would give us a statement saying he will not approve more funds for the Iraq War. Updates are rolling in, folks! Post your pics, vids and stories on your local Indymedia, and send ’em our way! Santa Barbara – A video, photos and more will be out tomorrow, so check back. For now, read the strikers’ statement on their website! Here’s the cliff notes: Students have brought activism back to UCSB, organizing the largest antiwar protest since the 70’s. Over a thousand people went to the rally, marched through campus, and then held a speak-out in the middle of the 217 freeway, before delivering their demands to the Chancellor’s office. Two protesters – one student and one prof. – were arrested, but have both been released, uncharged. They’re holding “Peace Out University” in a local park all of next week. Check out their website for more information. Santa Cruz (CA) – Around 300 students, workers and faculty turned out for a “Money for Wages, Not for War!” rally and march to the Chancellor’s office. It combined an anti-war message with the demand that the University of California immediate release money promised to low-paid service workers. The crowd was able to hear an update from UCSB via cell-phone, as well as news of a labor action at the UC Office of the President (Oakland) where 60 people were arrested. Photos. A powerful response at Sonoma State as over 300 students, faculty and community members rallied, drummed and danced in the center of campus at noon. 20 or more professors canceled their classes in support of the student strike. Lecturers spoke with proud and defiant voices as an F-15 BOMBER circled, in air, around campus TWICE. The day was highlighted by a large “dropping of the bomb” as students all mimicked dropping dead on the spot disrupting the flow of campus foot traffic. UC Los Angeles – Over a dozen students staged a die-in on the main-walkway of campus. They say they’re gonna do it every week ’til the war ends. 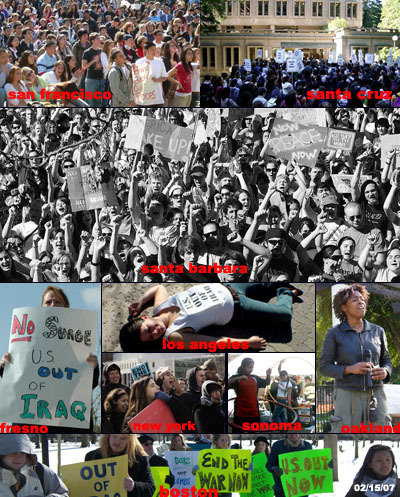 Photos on LA Indymedia || DailyBruin article. Vanderbilt (TN) – No first-hand accounts yet. Here’s an article: WTVF 5 – Vandy Students Protest War and an earlier one here. New schools are being added every hour to the list of those involved in antiwar actions on February 15th. Just today, we got confirmation that folks from UCLA, Emerson College, and Suffolk University (both in Boston) have preparations underway for tomorrow. This leaves us with 26* schools in 10 states – California, New York, Illinois, New Mexico, Massachussets, Georgia, Oregon, New Jersey, North Carolina, and Tennessee. And we’re still waiting to hear from MIT. * UPDATE: Santa Barbara City College is in. That makes 27! P.S. For some inspiration, see this op-ed on the history and successes of student strikes. P.P.S. A day-of story at Columbia U. details the huge support the strike has – including labor unions, professors, and grad students. Even the College Republicans havn’t put out a statement against it! 7 more schools onboard for the 15th! In just the past few days, we’ve seen an increase by half in the number of schools participating in February 15th actions. We’ve heard that students at Eastern New Mexico University, Lewis and Clark College, Vanderbilt, and UC Davis are now planning for actions Thursday, while students at Berkeley High, Fremont High, and the City College of NY will be joining with other schools’ events. How exciting! We’re in the process of getting in touch with these new students and will hopefully have details for you all soon. This brings the total list of actions up to 22! UPDATE: We’re hearing rumors of actions at UCLA and MIT. We’ll keep y’all updated as we hear more. p.s. Sonoma State (CA) has already kicked off their actions! See the SF Chronicle article here. Please sign your support and forward the link far and wide! UCSB Student Gov. Endorses Strike! Therefore let it be enacted by the Associated Students in the Legislative Council assembled: Call a strike where there will be no school, no work, and no consumption for students on the date of February 15, 2007. AS will close its offices on this date and advise all students and every other office on campus to observe the strike date and not attend the university or to purchase anything. Read the resolution and more on UCSB’s strike website. Actions Planned at 14 Universities!